Roger Corman's New World Pictures presents an enjoyably daft low budget action film. Prism Leisure UK R0 DVD. Written by Rob Kerchner (a DTV veteran whose other credits include Bloodfist VI: Ground Zero (1995)), Primal Species was released in the US as a sequel to the Carnosaur films, although there are no real references to the first two films, except for the rather unnecessary continual description of the dinosaurs as 'carnosaurs' in the dialogue even when the scientist confirms that they are a tyrannosaur and velociraptors (neither of which are actually technically carnosaurs...). The story itself is a very generic affair that could just have easily have worked with anything from aliens to tigers, Kerchner is well aware of the tiny budget available for the production and restricts the film to the usual B-movie locations with a small cast and it never tries to overstretch itself. Characterisation is minimal at best but pretty typical for the genre, the only really defined character is Polchek who spends most of the film making "funny" quips that just land on the safe side of being unwatchably annoying (although some viewers might disagree with this). Unfortunately Kerchner never really seems to pay much attention to sense or continuity - assuming you can look past the idea that the dinosaurs are being transported in highly insecure containers (the police just pull up the tailgate on the T-Rex truck) and the whole load of bizarre explanations that the scientist gives for why they are breeding highly dangerous creatures (rather than breeding some herbivores), there are still a whole load of logical gaps in the storyline. The army unit is initially sent in with no information on what they are fighting and only later told to bring the creatures back alive, so they have literally no chance of being successful - even when later they go back in, it is not for a while that they actually come up with a plan to capture the animals rather than just being walking bait. The appearance of the marines simply makes no sense, they suddenly appear in the warehouse despite the senior officer repeatedly stating in the previous scene that it would not be possible to provide any support or backup. Perhaps most noticable however is the fact that the LAPD seem to completely fail to notice that half a dozen of their troopers have disappeared and never make any attempts to investigate. Director Jonathan Winfrey (of Excessive Force II: Force on Force (1995) fame) does a perfectly adequate job with Corman's legendarily tightly reigned production budgets. He keeps the lighting low and the camera moving to allow only short glimpses of the creatures which avoids their limitations becoming evident, although the rubber suits used look infinitely better than the CGI used in more modern productions (cf. 100 Million BC (2008)). There are a couple of bizarre attempts at stylistic direction - a briefing sequence is shot entirely in ultra-close-up for the first minute before panning back in what seems to be a big reveal - to reveal nothing at all and the rest of the scene continues as normal. There are no big names in the cast here and the acting never really ranks above average, but it gets the job done and there are none of the stand-out terrible performances that blight many DTV productions. 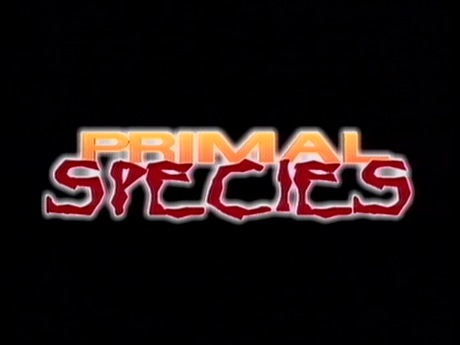 Primal Species has a plot full of holes, takes place entirely in warehouses, boasts uninspired acting and direction and rubber dinosaur suits, yet like most of Corman's B-movie productions, it has an enjoyable charm and makes for entertaining viewing. Fans of DTV B-Movies will find plenty to enjoy here. Directed by anyone	interesting? Jonathan Winfrey - now mostly a television director, his productions including Watch Over Me (2006/7) and Saints & Sinners (2007) he earlier helmed a few DTV films including Bloodfist VII: Manhunt (1995). Who is it for? This one is strictly for fans of low budget DTV monster movies. Availability Available as a single disc release as well as in various Prism Leisure multi-packs. Other regions? American R1 release from 'New Concorde' as Carnosaur 3. Poor acting, terrible effects and a logic-free storyline - one for experienced DTV fans only. A perfectly adequate DVD release. All text in this review written by Timothy Young - 1st February 2012.